7868 Mace Windu's Jedi Starfighter is a Star Wars: The Clone Wars set released in January 2011 (in some parts of the world the release was not till June). The set includes Mace Windu, his droid and his Delta-7 Jedi Starfighter, two Battle Droids on STAPs, and a Tactical Droid on a speeder. Mace Windu's Jedi starfighter is unlike any of the other previous starfighters. While the starfighter has sloped bricks, decorated wings, landing gear, a droid in front of the cockpit, and cockpit like that of the rest, but the way the wings are held on and it's unique function is different. The mains colours of the starfighter are white and light grey, but other colors such as maroon, dark green, and sand are on it as well. The starfighter has basically the same body build as Plo Koon's Jedi Starfighter, except for it's function and cockpit. The function of this starfighter is four flick-fire missiles with transparent purple tips at the bottom. Unlike Ahsoka's Jedi Starfighter, theses are at the rear of the starfighter and can be triggered in twos by pushing two bars at the back. The cockpit has the same glass piece as all the other Delta-7 Jedi Starfighters leading up to this point, but the sides of the cockpit are part of the wings. The wings of the starfighter are white and half decorated with flat maroon, light grey, white, and sand pieces going forwards. About the place where the glass is are two dark green sloping pieces which create the cockpit's walls, an effect unlike an of the other previous starfighters. At the bottom of the wings are some bricks to help hold the wings firm in place, unlike the previous ones which could wobble slightly. The Tactical Droid's speeder features a front hood with a glass window tilted by a handle plate. Behind this is a brick-built blue chair and the controls. Under the seat are the foot pedals for driving the speeder. The back has a slope with two triangular signs attached at the very rear. The sides of the back has sloping bricks, and below that some flat bricks and a stud. 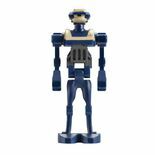 Two identical blue-coloured STAPs are included in the set, each piloted by a Battle Droid with curved arms. Some of the details of the STAPs are two dark grey engines, two dark blue wings, a panel with sloping bricks at the front going from the bottom up, and a hood at the front top that joins onto the two guns. A sticker is used on the front panel of each showing that they are from the CIS. The STAPs have two transparent pieces to make it appear that they can fly. Mace Windu's Delta-7B Jedi Starfighter was used by Mace Windu throughout the Clone Wars. After Mace's droid R8-B7 was destroyed when Mace was trapped with Anakin Skywalker on Vanqor, R2-D2 comandeered this starfighter to go to Coruscant and inform the Jedi of the situation. Single Trooper Aerial Platforms, commonly referred to as STAPs were flying vehicles commonly used by Battle Droids before and during the Clone Wars. A flitknot speeder was a vehicle manufactured and used by Geonosians. Count Dooku was known to use a modified version of this speeder during the First Battle of Geonosis, and at least one Tactical Droid was also known to have used one. This is the first set to include the Tactical Droid, however early preliminary images of the 8098 Clone Turbo Tank stated that a Tactical Droid was to be released in that set. 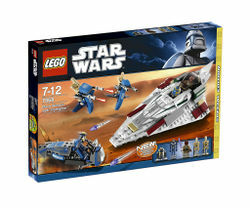 This set was released in Europe in January 2011, but was not released until the second Star Wars wave in the US and other areas. This is the second set to include Mace Windu in his The Clone Wars variant, but the first to have him with a darker transparent purple lightsaber blade. The STAPs included in this set are identical to the STAP included in 7675 AT-TE Walker. R8-B7 is exclusive to this set. This is a description taken from LEGO.com. Please do not modify it. (visit this item's product page) Repel the droid ambush with Jedi Master Mace Windu™! Blast through the droid ambush with Mace Windu’s Jedi Starfighter™! With quad flick missiles and the reliable R8-B7 astromech droid to navigate and repair damage, Mace Windu’s Jedi Starfighter will be more than a match for the tactical droid TX-20 on his Separatist speeder. Also includes 2 battle droids on STAPs. Open cockpit to play inside! Launch the flick fire missiles! Facts about "7868 Mace Windu's Jedi Starfighter"
Repel the droid ambush with Jedi Master Mace Windu™! This page was last edited on 9 January 2016, at 22:04.